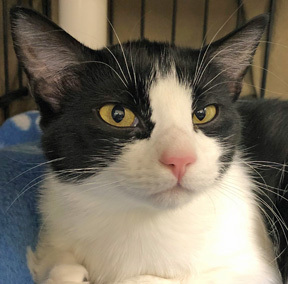 Timerine is a very shy gentle kitten who is not yet ready to be pet although she rolls across the floor at one’s feet and stretches out a paw to touch one’s foot, but quickly withdraws if one moves toward her. Her gentle nature means she may hiss when presented with a bowl of wet food, but one can slowly gently pet her. She loves playing with other felines for hours and with people who have a wand toy. Not yet eating treats from one’s hand, she is ever so tempted. With a lot of patience and time this kitten will make a great companion to both felines and people in a loving family.